It’s been a crazy-busy week. So, though it’s not over, I’m taking a moment and pouring myself a dirty pickle martini. 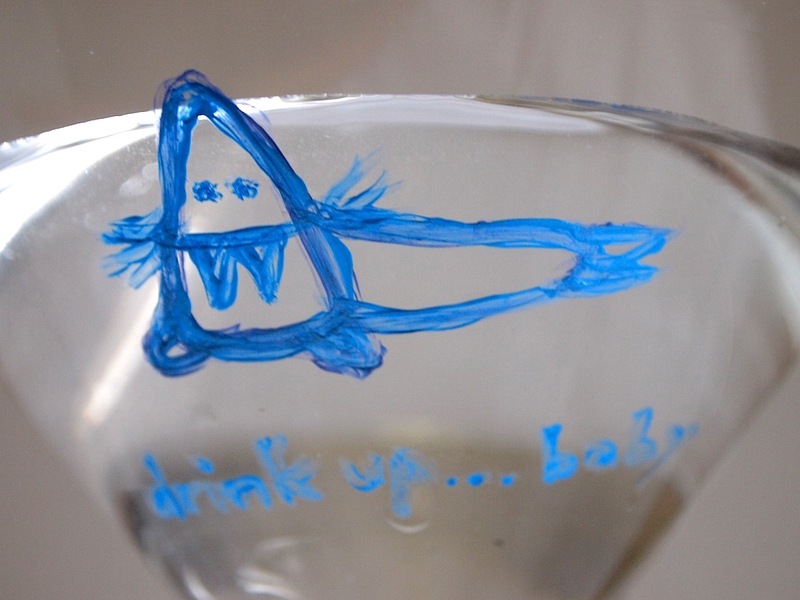 I love martinis, and find them extremely refreshing – and I like mine dirty and briny. I made pickles recently, and have gradually been crunching my way through several jars. One of the best things about homemade pickles is that their brine has a lot more flavor than the commercial stuff; it goes wonderfully in a cocktail. For garnish, I used pickling dill and an onion pickled along with my cucumbers. Gin and salt just go together so well for me: one of my other favorite cocktails is the Salty Dog – gin and grapefruit in a salt-rimmed glass. First, the classic 1960s dry martini is 5 parts gin to 1 part dry vermouth; older recipes called for 3-to-1, and really dry martinis go up to 8-to-1. I like mine dry. To get started, chill your glass in the freezer and gather your shaker, gin, and vermouth. And possibly pickles if you’re feeling salty. I used Tanqueray in this martini; it works great for dirty martinis. For traditional ones, though, I prefer Plymouth. Next, crack your ice. This involves breaking cubes up, but not crushing them. 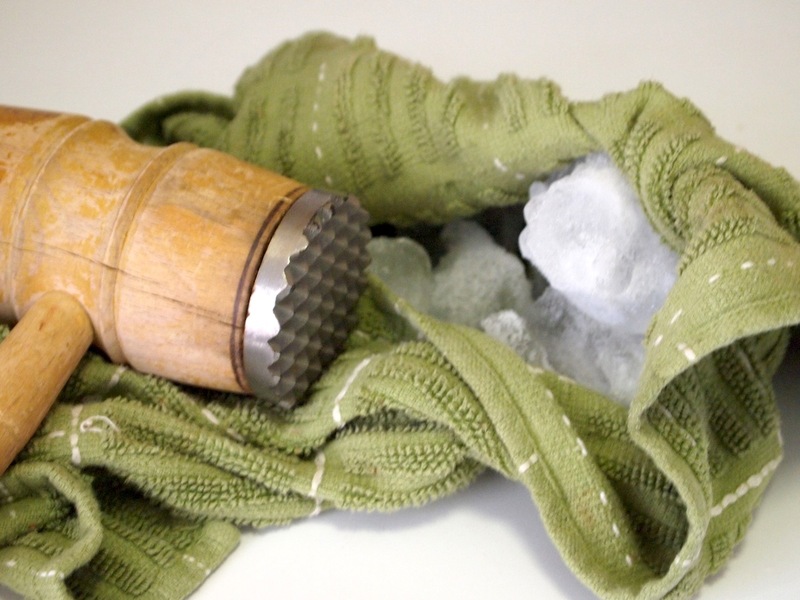 The easiest way to do it is to wrap the ice in a dish towel (not too much at a time) and pound it with a mallet. A meat tenderizer works quite spiffily. The ice chunks should be about half to one-third the size of a full cube. This will ensure that there’s enough surface area to chill the alcohol quickly, but not so much that the ice melts and waters down your drink. 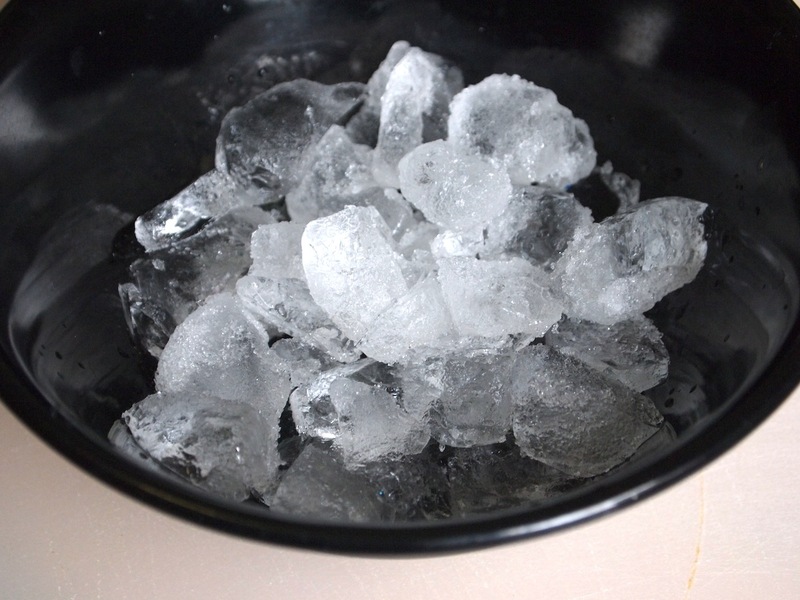 The ice should be dry and hard-frozen: if it gets a little melty in the crushing process, stick it back in the freezer for a bit. Place the ice in your shaker and pour the first the gin (the gin should “smoke” during the pour) then the vermouth (and a splash of brine if you so desire) over it. Shake briskly about ten times and strain into your chilled glass. You can also serve the drink “on the rocks” over whole ice cubes in an old fashioned glass. – Garnish with a twist of lemon peel or an olive. – Sweet martini: half sweet vermouth, half gin. 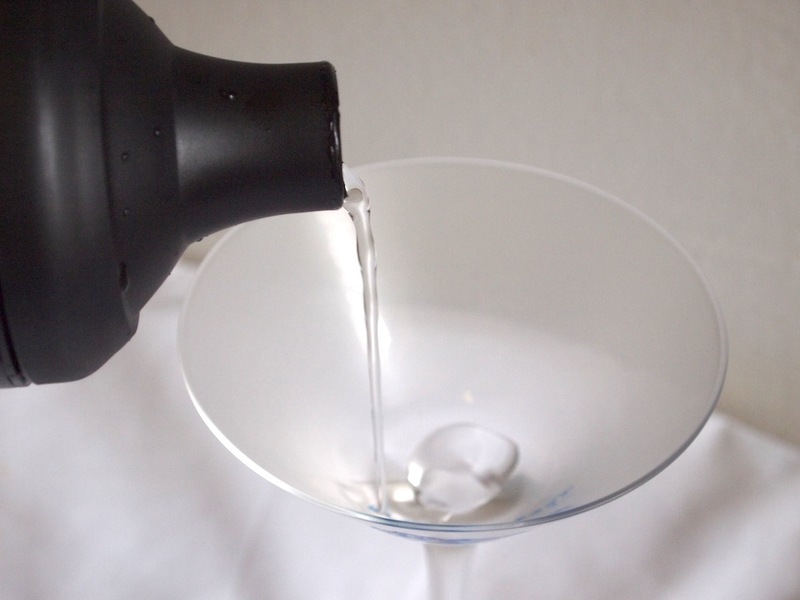 – Vodka martini: substitute vodka in any of these recipes. – Medium martini: 3 parts gin, 1 part each dry and sweet vermouth. – Gibson: dry or extra dry martini served with a lemon twist and a few pearl onions. – Dillatini: substitute a dilly bean for an olive. – Tequini: use tequila instead of gin, and serve with lemon peel and an olive. Finally, a dirty secret to go with a dirty martini. I’ve broken most of my glasses over the years, and actually only have a couple left. Both are decorated: some friends and I use glass paint to personalize martini glasses in college. One of these had way too much color for my photo shoot, but the other had pretty minimal decoration, which I cut out of my main pics. I could not, however, resist sharing. And now, do as the walrus says: Drink up…baby. I can’t believe I’m admitting this but I’ve never had a martini! Wait! Revise! Never had a TRUE martini. I had this amazing one with grapefruit juice– yummmmmm… will have to try! I love this idea! I just finished our pickles from last year so I will have to wait until I make some again. I love martinis, dirty or otherwise (clean?). I’ve been making mine with the pickled green tomatoes I have left over from the summer, it’s a lovely little twist! 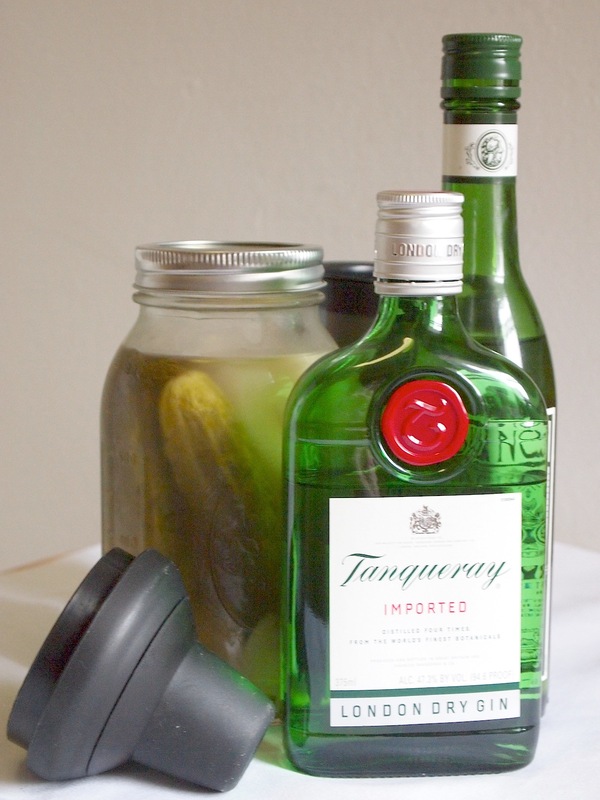 Yum – I love using pickle juice in drinks. I’ve been putting some in beer with chili salt lately. Looks great! I’m always game for a new cocktail. Tomorrow might have to be martini night. I love a good martini! Awesome post :)! I will have to try the pickle martini! Yes! Yum. I love a dirty martini…and I love pickles! This is a great idea. Thanks for making me crave martinis at 7am. LOL! I love a dry vodka martini – I’ll have to try it with pickles (but will wait until after noon). I love pickles….and martinis that are dirty and briny as well. Thanks for this! This martini looks absolutely yummy. I am a big fan of dirty martini’s, the drier and dirtier the better. This is an interesting combination that I had never though of before. I will certainly be trying it out. Thank you for sharing! Interesting combo. I’ve only recently started trying different martinis. I’ll give this a whirl. Funny spell check gherkin not berlin!